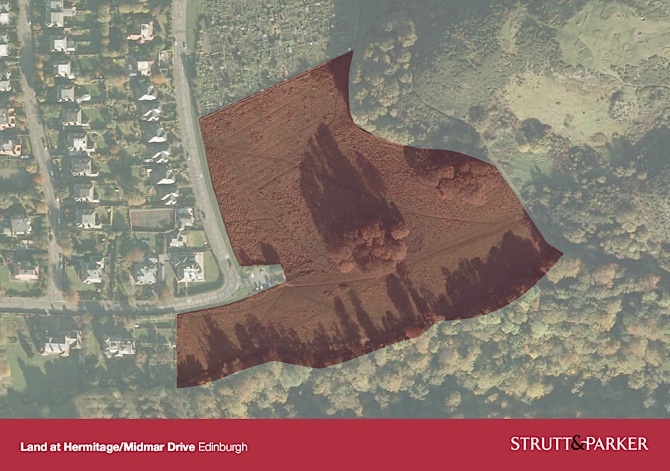 The land illustrated above (Midmar Paddock on the eastern slopes of Blackford Hill, Edinburgh) is currently for sale via Strutt & Parker (sales brochure here – 925kb pdf). The reason for publishing this blog is to ask “who owns this land? Does anyone know? Strutt and Parker refuse to divulge the answer. The land is not registered in the Land Register but deeds are probably recorded in the Register of Sasines but it will probably cost around £50 and 1-2 days work to find out the answer there. I have neither. So I thought I might ask you. Can anyone help? Improving access to information on land forms part of the Scottish Government proposals for land reform. See Briefing (1.7Mb pdf). I have now determined the ownership of the Midmar Paddock. The Register of Sasines Search Sheet can be found at the foot of this text for those who are interested to see how land transactions were recorded prior to the Land Register which has been in operation in Midlothian (the old county including Edinburgh) since 1 April 2001. 1923 John Gordon of Cluny sells 18.6 acres (Midmar Paddock and allotments to the north) to Alexander Grant. In 1938 the land is transferred to the Trustees of Sir Alexander Grant, 15 Hermitage Drive, Managing Director of McVitie & Price, Biscuit Manufacturers, Edinburgh & London. 1954 Allotments area conveyed by Trustees to Graeme Ellizabeth Laing. Midmar Paddock remains with Trustees. 1958 Midmar Paddock conveyed to beneficiaries of Trust – Hector Laing, Alexander Grant Laing and Robert Douglas Grant Laing. 1973 Alexander conveys his ⅓ share to Trustees of Alexander Grant Laing. 1973 Allotments area conveyed by Graeme E Laing to Trustees of Alexander Grant Laing. 1983 Trustees of Anthony convey their ⅓ share to Anthony. 1993 Robert conveys his ⅓ share to Nettling Properties Ltd.
1999 Nettling Properties conveys its ⅓ share to Flagstaff Properties Ltd (Turks and Caicos Islands). 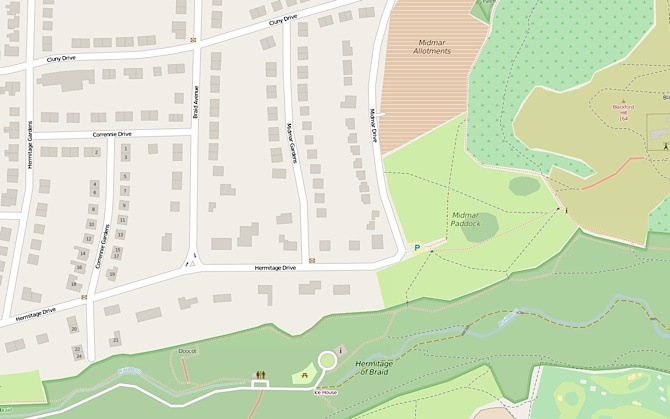 2011 Flagstaff Properties Ltd. conveys its ⅓ share to Midmar Properties Ltd.
28 November 2014 Trustees of Alexander G Laing conveys allotments site to Blackford Hill Ltd. The allotments site to the north is owned by Blackford Hill Ltd.
Blackford Hill Ltd. is a company registered in Scotland No. SC466028 with its registered office at Logie Estate Office, Logie, Forres, IV36 2QN (see here for details of shareholders). Midmar Properties Ltd. is not a registered company in the UK and is probably incorporated in the Turks and Caicos Islands. Interestingly, what this reveals is that the 2003 Tree Preservation Order referred to by Robin in comments names only one of the three joint owners. Additionally, the link to the Local Development Plan response provided by Dave Leslie in comments reflects the views of only one of the three co-owners (Trustees of AG Laing). It also contains a useful map showing the two separate ownerships (though not the up to date owners) and interesting insights into why the owners are wishing to sell the land.